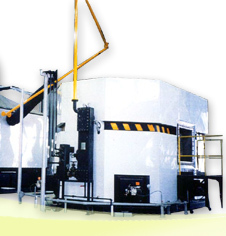 The Management of Refining and Recycling Plant is a capital and skill-intensive business. It is important to provide up to date technology for the plant manager’s benefit. “Land, Finance and Electric Power”are the basic requirements for setting up a refinery for the refining and recycling of waste engine oil. The principal capital expenditure requirement for the establishment of an ACT-Diesel refinery include the cost of land, factory buildings, equipment and so on, as well as the build up of stock of waste oil and management fees for managing the site for the first three month period. Please refer to "Investment & Revenue" for more details. Land requirement is approximately 3,000 m2. Please refer to "Manufacturing Diagram" for more details. Besides purchasing the land, it is necessary to estimate the costs of facilities and equipment, together with the expenses of management and materials etc. ※Mangement expenses includes, Water, Electricity, Waste Oil and Personnel. Electric Power is essential to the refinery operation, so it is included in the management expenses. "ACT-Diesel Advanced Cracking Technology" also named "ECOTECH" is a world-wide patented technology registered in 11 nations, converting waste oil to #2 diesel by high-temperature. .Basic equipment comprises of one high-temperature splitting decomposition stove, one rectification device and one high-pressure air-cooled condenser. Put together these core components make up the ACT-Diesel refining unit so that 85 to 95 percent of hydrocarbon is separated from waste oil. The operating temperature of the system provides similar working conditions for the splitting and decomposition of the waste oil into diesel, the same as the process of separating diesel out of crude oil from a distillation column, known as the "Topping Process" in refineries. The quality of the diesel produced by the ACT-Diesel refining plant is very close to the diesel #2, produced by a refinery “Topping Process”. The area of ground which an ACT-Diesel Refinery requires is approximately 1,300 m2, and with other considerations, including health & safety with the proximity of tanks and vessels to land boundaries etc, it is recommended that an area of around 3,000 m2 should be made available for the site layout. ACT-Diesel operates on a Batch Type process. It needs 87 hours to complete the total operation of product conversion. The manpower requirement, - needs only six staff members divided into 3 shifts and 8 hours a day monitoring the process. It needs another two assistants to help in the process of clearance of the splitting decomposition stove after 87 hours of operation. The ACT-Diesel Refinery is equipped with a Digital Control System, so the process is managed by remote control. Therefore the operator “Hands on”manpower requirement is very low. From a safety point of view, operating ACT-Diesel by Batch Type for cracking oil at high-temperature is ideal. The splitting decomposition stove needs cleaning after every 87 hour operating cycle. It takes about ten hours to clean down the unit and the setting up the control equipment and preparation of the next charge. Also, it gives the operator the opportunity to examine the stove every 87 hour cycle. It helps to make the operation safe. During the last 10 years or so, 18 refining plants (over 42 groups of the main workstation) of the ACT-Diesel Technology units, have been running in North America, Europe, Asia and Australia, completely accident free. The advanced technology for the regeneration of waste oil is a significant scientific industry for the prevention of serious pollution. Because of its obvious economic effect and finished products value, it is easy to sell in market place. The introduction of this advanced technology can bring investor benefits and excellent prospective business. To date, most ACT-Diesel plants are operating in advanced industrial nations. There are plentiful supplies of good quality and low moisture content (less than 2%,) waste (used) oil. To recycle waste engine oil of 50 barrel (about 200l) capacity costs USD. $11.50. The price of waste oil is USD. $0.058 per liter (USD.$11.5/200 =USD.$0.058). Compare this with the price of the cheapest diesel – as low as USD.$0.35, so it produces high added value, - up to 6 times in value of finished product. Investors get high revenue and few industries can be so competitive. According to the standards set by participating countries in Europe, the finished product- #2 diesel of ACT-Diesel Technology would not be used directly in vehicles but only used as fuel oil in generators and in agricultural machinery and industrial equipment. To be used as Vehicle Gas Oil on highway, #2 diesel needs to be mixed with #1 diesel in the ratio of 50:50 proportions. If not used in this way, then at least the price of #2 diesel is less than 90%~95% of #1 diesel. In conclusion, the value of ACT-Diesel Technology is recognized as technically advanced compared to other technologies and is, therefore desirable. Military units or other enterprises requiring large amounts of engine oil, hydraulic oil and other lubricating oils have to pay for disposal or the recycling of waste oil. For this reason the benefits for these consumers supporting the Advanced Cracking Technology - Diesel industry of refining and recycling waste engine oil is considerable. In addition, some countries, for example - the U.S.A. and parts of Western Europe indicate the price of waste engine oil, for recycling, as approximately USD. $8..5 per barrel. This is because these countries are concerned about air pollution caused by toxins such as dioxins and NOX which originate from burning waste oil. Legislation is now in force to discourage this so that industries now have to consider other means of disposal of waste oil. One consideration is that industry should carry out the recycling operation as quickly as possible. Otherwise serious problems will develop and high costs of alternative methods of disposal will prevail, such as shipping costs to countries where tough legislation does not exist and allows for the burning of these toxic wastes as secondary fuel. By dealing with the problem correctly and efficiently, provides benefits for all, including the populace by improving health issues. Whilst there are no laws related to the legislation mentioned above in China or Taiwan, it is imperative that this problem is addressed as soon as possible, so creating the benefits, including health & safety as well as the financial benefits. In so doing, all industries engaged in recycling and regenerating good quality product, with no harmful by-products, from waste oil will reap the rewards and protect the environment at the same time. These rewards, including considerable financial rewards, which will result from the sale of finished product - #2 diesel from ACT-Diesel will provide both commercial and environmental benefits to the local and regional population as well as the processor.